I have a bit of a particular interest in Cloud ERP providers moving into the manufacturing space. Manufacturing is a highly complex space and one where the traditional ERP vendors have a very strong position – manufacturing relies on complex interconnected functionalities and often needs the connection of multiple organizations, locations and divisions to work – an area that should be ripe for disruption by the cloud. Until recently there hasn’t been a lot of obvious progress being made for manufacturing when it came to cloud ERP, interestingly in its latest earnings call, NetSuite called out manufacturing in particular as a strong area of growth. I was interested to read then that Acumaticarecently announced a fully integrated manufacturing, distribution and accounting solution. The solution, JAMS Manufacturing for Acumatica, was created by JAAS systems migrating their mid-market manufacturing suite over to Acumatica. In doing so they have created what they’re calling a fully integrated manufacturing, distribution, and accounting solution specifically targeted to mid-size manufacturing companies. 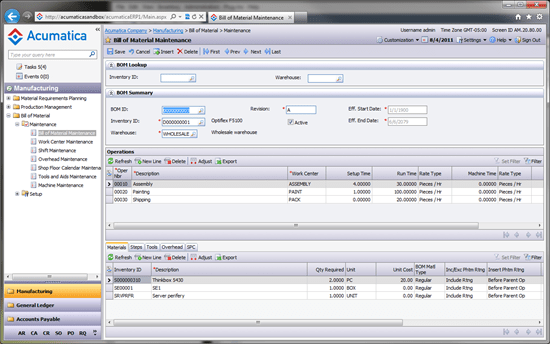 The solution utilizes a common UI, integrated menus and shared database elements. In terms of pricing, JAMS/Acumatica begins at $7,500 to license the manufacturing suite, with additional modules priced separately. SaaS customers can purchase a turnkey solution for $500/month (sold as an annual subscription). This is inline with Acumatica’s approach towards licensing which offers both perpetual and subscription based options. Manufacturing functionality is an obvious extension for the new breed of cloud ERP players – it’s good to see Acumatica step up and provide for this important sector also.